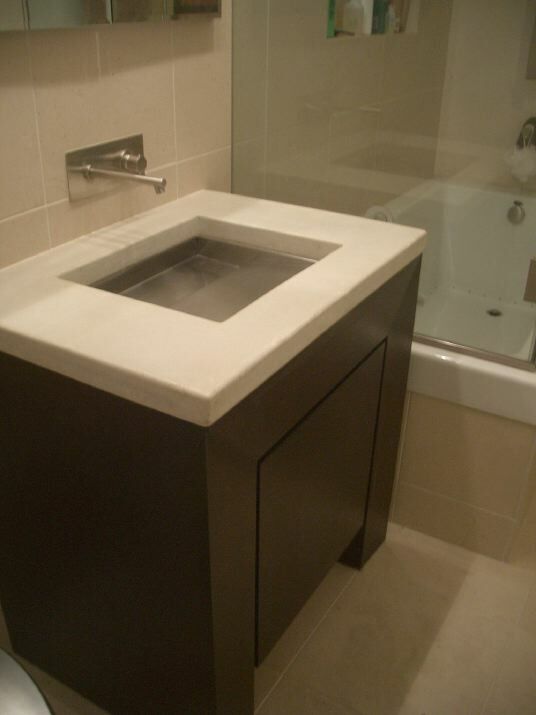 We are Avant Design, Inc., a New York City based concrete polishing company. We polish concrete floors in commercial, industrial, and residential buildings. We use the most enviromentally sustainable, green methods; we diamond polish the actual concrete in a multi-step process up to as high as #3000 grit, by using progressively finer and finer diamonds to mechanically abrade, hone, and polish the surface. We use the finest penetrating densifiers and sealers that don't leave any plastic film on the surface that would keep you from the feel of the smooth, durable, breathable, polished concrete. Concrete, as we generally know it, consists of portland cement; cement is an ingredient of concrete, along with graded sand, and a larger aggregate, in a diameter of from three-eighths of an inch, or pea-size, up to three quarters of an inch in diameter, made from crushed bluestone, granite, limestone, graded river rock, or a man-made, lightweight aggregate, to produce lightweight concrete. Concrete has been used as a building material since at least 800 BC by the Greeks, some of whose structures are still standing today! What then, is polished concrete? 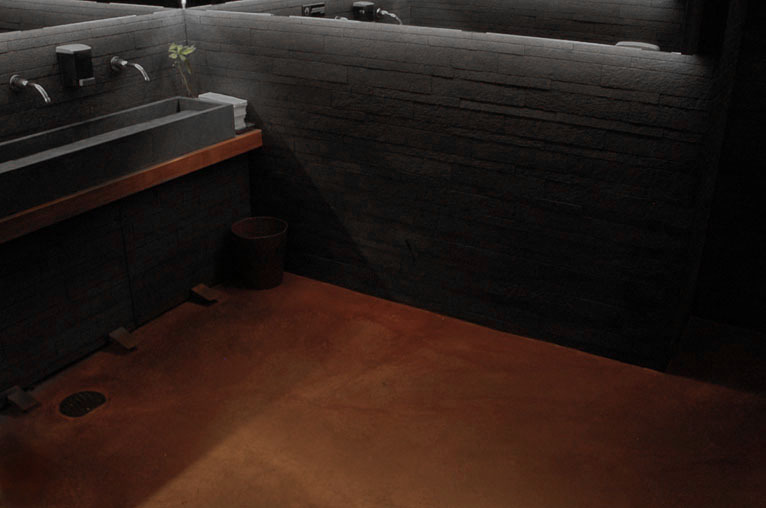 We are all familiar with concrete as it is used in everything from our sidewalks to our bridges, in our houses and high rises, but although its use continues to increase, many aren't yet familiar with this versatile substance when used as an interior finish. Concrete itself can actually be polished to a high gloss, resembling marble or granite, yet with its own unique set of characteristics. 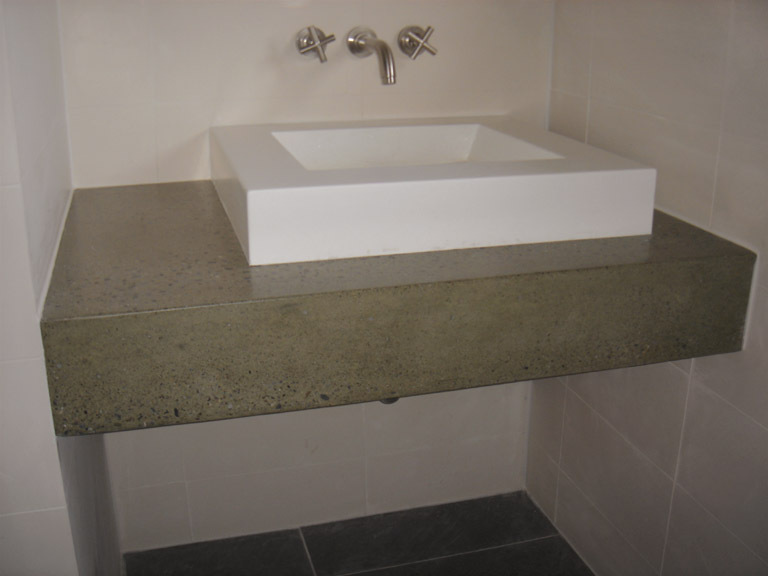 Polished concrete gives an unparalleled tactile sensation: a warm feel and texture unlike any other material. It can be refined to be as smooth as stone which has been shaped, smoothed, and polished by the sea. 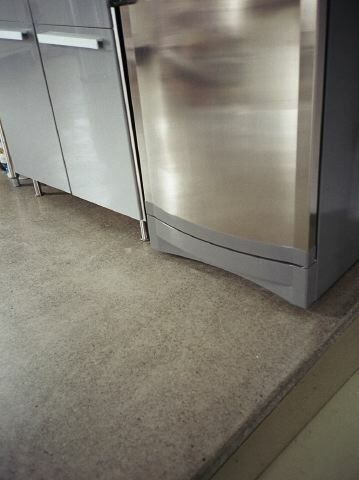 Polished concrete has a low price/performance ratio when compared to other types of flooring. 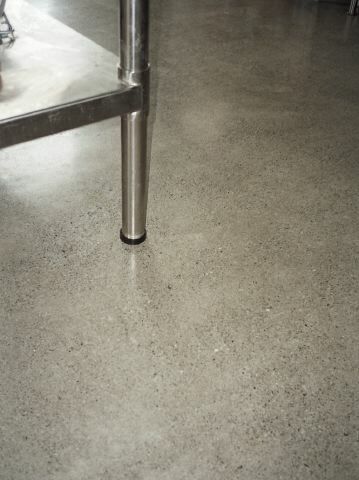 Click here to see a chart comparing polished concrete with other options; you may be surprised! Architects, designers, business owners, builders, or homeowners, e-mail your specs or drawing for a free quote. All of our services are available to order for new construction or remodeling, commercial, industrial, and residential. Please take a look at the pictures below of some of our recently completed work. This polished concrete floor is located in the US offices of a British television production company in Manhattan. This lobby floor in Manhattan is a TRU concrete overlay, poured and then polished. This floor is in Japan Mart at Industry City, Brooklyn. Japan Mart at Industry City, Brooklyn. Japan Mart as published in the NY Times. Modern offices benefit from both the aesthetics and practicality of a polished concrete floor. This 11,000 square foot 100 year old former factory floor was ground, patched, and diamond polished to a beautiful 1500 grit shine. There is not even a guard on this floor; we use penetrating sealers! This showroom floor was dyed charcoal during the polishing process. We ground, polished, and stained this 16 foot high helical concrete staircase. We polished the existing concrete floor in this private garage, which was featured in the April, 2013 edition of Architectural Digest. 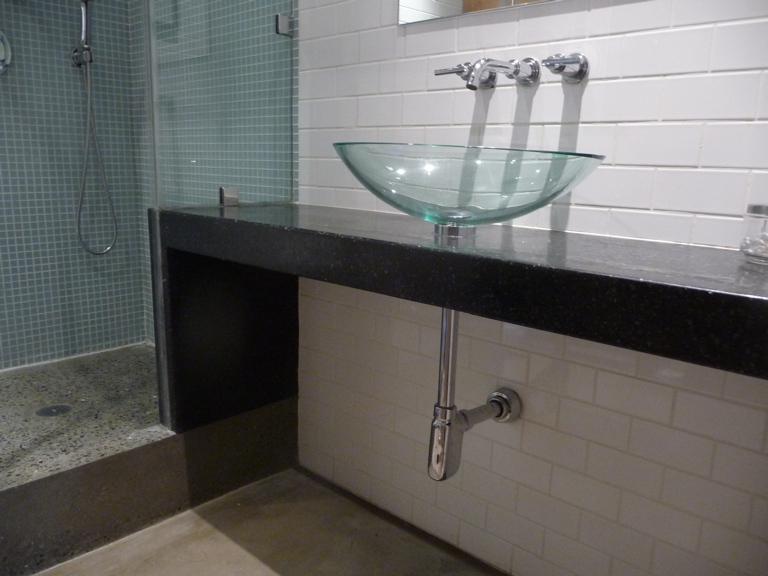 was formed and poured in place by the contractor, then ground and polished by Avant Design Inc. This is a 3 story high concrete column that we ground, polished, and stained. In this lobby, we poured a concrete overlay having embedded concentric metal circles, and then polished the floor. This is a 5000 square foot nail salon on the upper west side. This newly polished 16,000 square foot concrete floor is in a supermarket in Williamsburg, Brooklyn. This is a "cream polish" ie: with minimum aggregate expoure. 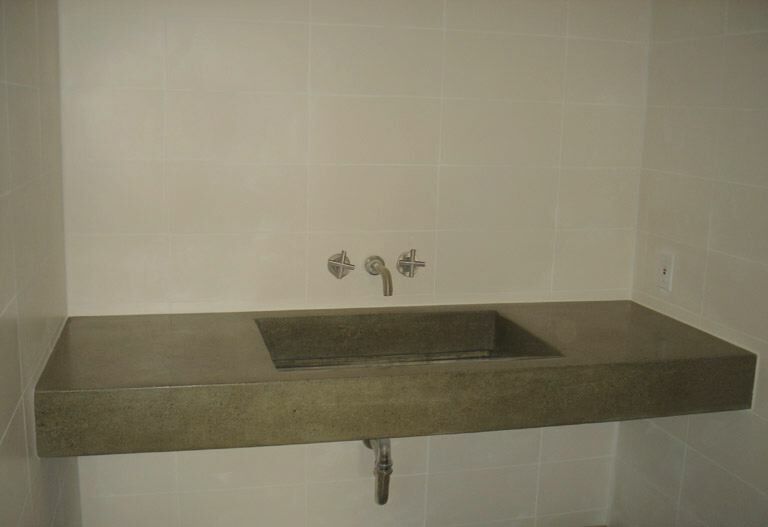 This 11,000 square foot concrete office space in Manhattan required extensive repairs, prior to polishing. The floor of this 10,000 square foot loft was polished for the future home of Ilan Rubin Studio. The floor was polished prior to partition installation, resulting in a substantial saving for the client on edging costs. in the water, toasty warm! Ask us about including radiant heating in your tub or floors. was cast and polished offsite, then brought to the site and carefully fitted into place. 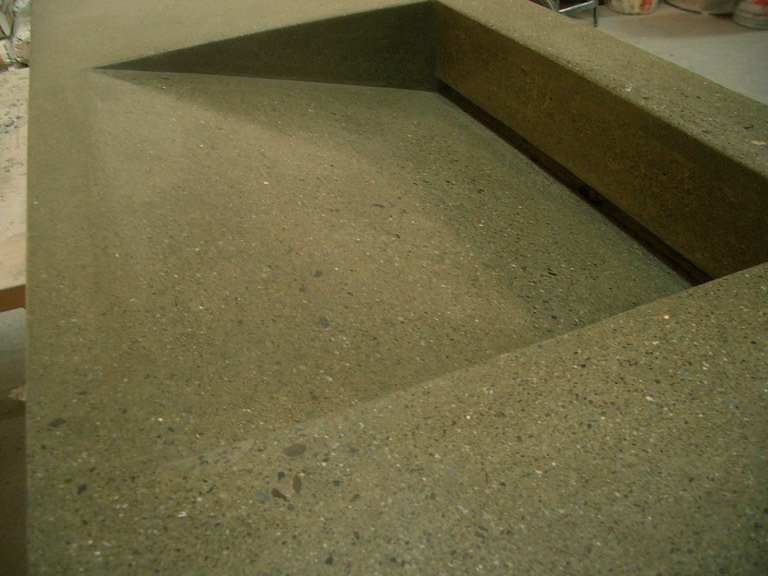 when concrete is diamond polished to a #3000 grit. This floor was covered with a layer of dyed Ardex, then ground smooth. This existing slab with integral hot water heating, was ground smooth and polished. This floor was done with a custom colored concrete topping which was then polished. This floor in Bloomingdale's 59th Street was done with a custom colored concrete topping which was then polished. The walls in this bathroom were covered with a concrete that can be colored to match any Benjamin Moore color chip, burnished, then sealed. and here has been treated with an acid stain to create a rich, leather look. Many other colors are available. Below are before and after pictures of a residential brownstone basement floor we ground and polished. 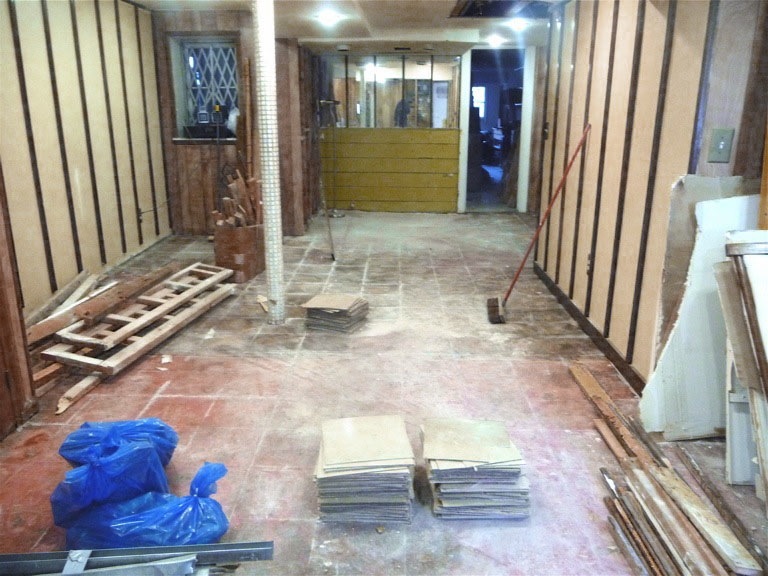 This basement had been subject to previous flooding episodes and the owner wanted a clean surface for a children's play room that would survive future flooding and be simple to clean. 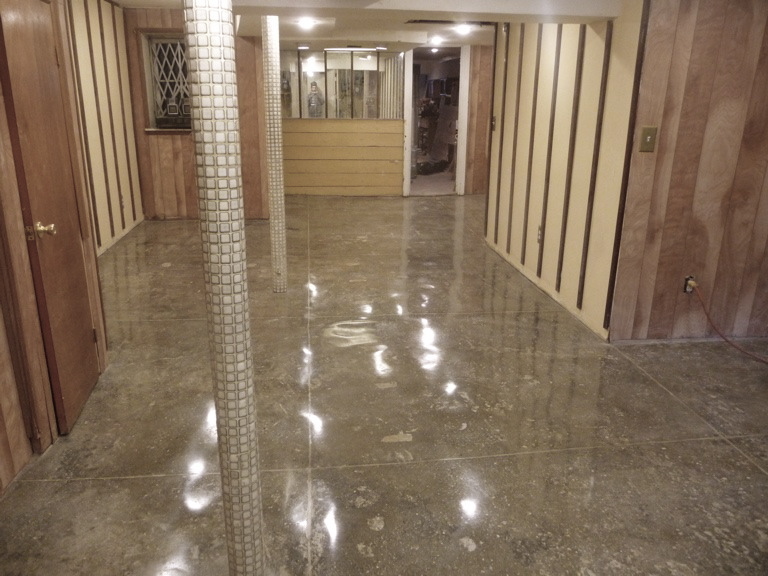 If you have basement flooding problems, ask about the Avant Design polished concrete floor solution! e-mail us with your questions, information, or drawings.